Okay, I’ve seen this elsewhere on the internet so I think it’s probably safe to share here. 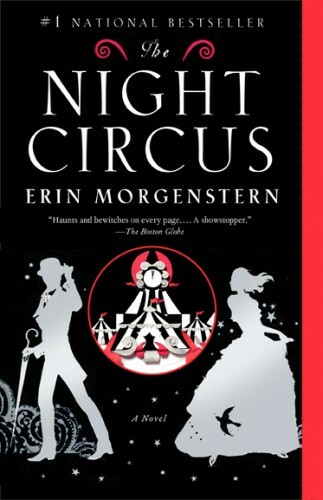 This is the US paperback cover of The Night Circus. Have I mentioned that I’ll be at Book Expo America again this year? Because I will be at Book Expo America again this year. It’ll be all full-circle and surreal and I’ll likely look less like a deer in headlights this time. I hope. I have blog posts that are not post-shaped yet but I will be posting them in the next while. They involve things like books (not by me) and a follow up to the time and the not having of it post and likely photoblog travelogues but more on that later. Speaking of time, I’m doing that thing where I have so many little things to do that they end up piling up to that big thing time consuming size and thus I am again behind on things like emails and laundry and laundry ends up taking priority because it’s still chilly out so I’d like to be able to wear clothes. I don’t actually have a fourth thing to add, I just thought this list would look better with four items rather than just three. I’m not that good at visualizing. I practiced constantly but I only managed to master everyday objects. Apples, pens, coffee cups. Not particularly inspiring dream fodder. No matter how I tried I couldn’t capture anything fantastical that didn’t feel fragile and thin and fleeting. But I knew I must be doing something right, what with the crispness of the dream-apples and the perfect level of sweetness in my dream coffee. 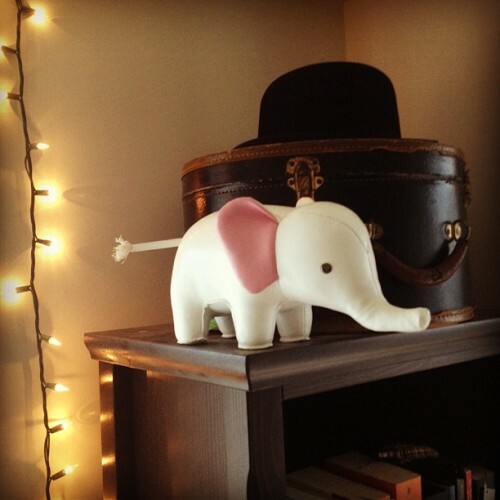 So I found more adventurous objects to fill my everydays, though it required creative shopping. 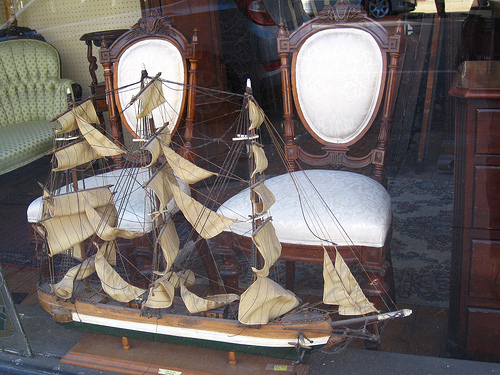 I found the ship in an antique shop. I studied the masts and the rigging and the curve of the bow, slowly learning every detail. Now I can sail the seas in my dreams. Okay, my web guru did some magic things and it appears everything is back in working order complete with classic theme, hurrah! At some point I’ll likely end up redoing the whole site anyway, but for now it works. Email is also working (though I’m still way behind on replies) and I may have lost some comments in all the construction, my apologies for that. So in the process of moving the site to a new server something got… grumpy with my wordpress theme and it seems the theme support has vanished from the internet and I have managed to make it functional if less pretty for the moment. I’ll be spending the evening trying to either make it less grumpy or find a new theme (suggestions welcome – something minimal & customizable) and also eating ice cream. Also! This means my site-based email is down, rah. The first to arrive is confused but only for a moment before a companion appears. Look! the first bubble says to the second, and as more bubbles join them the word is repeated and echoed by bubble after bubble. Look, look! They tumble upward and dance on breezes, giddily spinning as they stare at the strange new world they have been blown into. Look! they say to their fellow bubbles, sometimes so enthusiastically that they bump into each other and cling and spin together. They peer in windows and exclaim at the contents. They ask questions about how and why but the answers seem unimportant. People smile at them and they smile in return, giddy for having made people smile by simply existing. 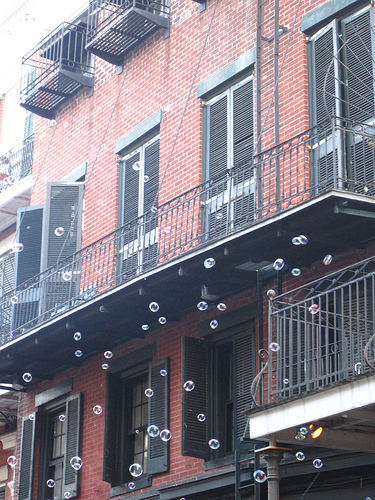 When some bubbles begin to pop, the others gasp and sigh and rush to share their thoughts and observations with their remaining friends. And when only a solitary bubble is left with no one else to talk to it looks around and around at the sky and the ground and everything in between in blissful silence until it too explodes with joy. 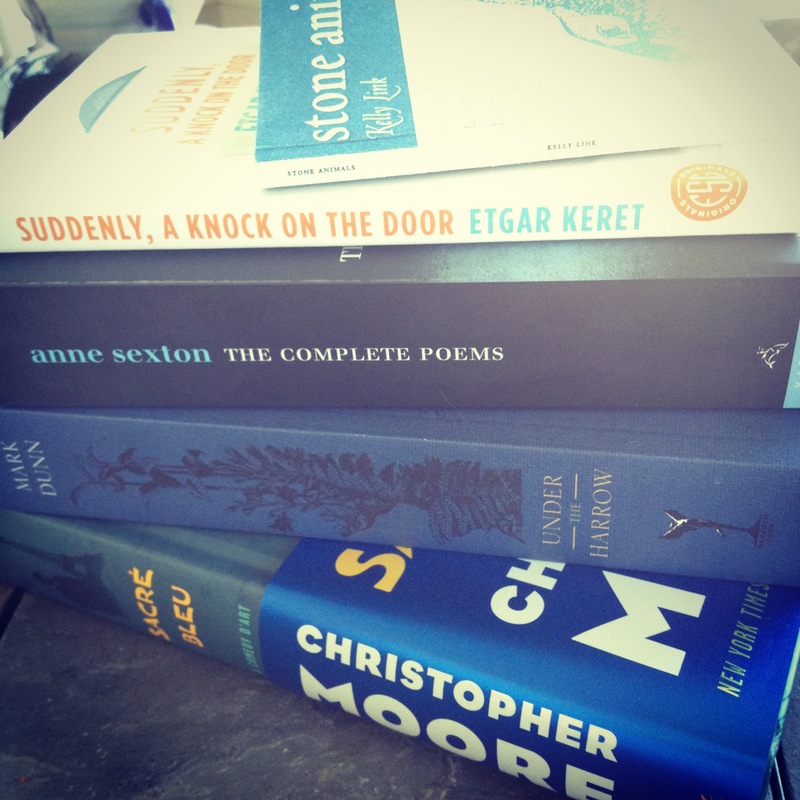 in lieu of a post that was not a post, books. I seriously just spent a considerable amount of time writing a post that was mostly little bits of things and also a list of things that I am going to post about in upcoming proper posts and then there was some sort of draft-saving internet hiccup and now that post has vanished. So, as I do not have time to rewrite it today, I instead give you a fraction of that missing post in the form of the pile of unintentionally color-coordinated books I bought today. I blame the fact that the text in Sacré Bleu is actually blue for ending up with a very blue bunch of books. It’s not that good a trick, really. There are ooohs and aaahhs when I show someone who hasn’t seen it before, but only the first time. After the second time they complain that I can’t do it with anything else. 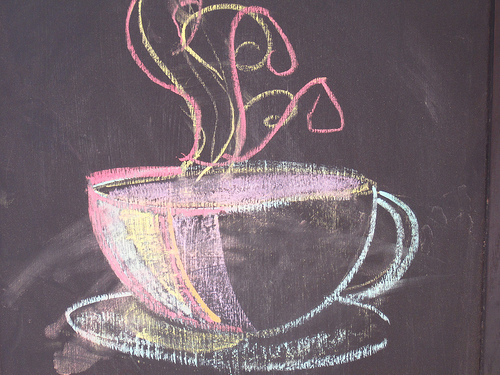 Like it’s not that impressive to draw something in chalk and have it become real once the drawing is complete since I can only do it with teacups. Even though the teacups materialize with actual tea inside. But the tea will only be hot if I draw the steam, and I have to draw lots of it in order to obtain proper tea-drinking temperature. I usually don’t drink it, anyway. It’s never sweetened, even if I draw sugar cubes. No matter how much I wish for Earl Grey. I have been neglecting the internet! Sorry! I’ve mostly been busy but also it decided to be properly springtime weather-wise which has been nice, though today it was supposed to be springy but the weather report lied to me and instead of springtime sunshine I got April showers with weird pockets of sun, sometimes heavy showers and I got rather soggy. 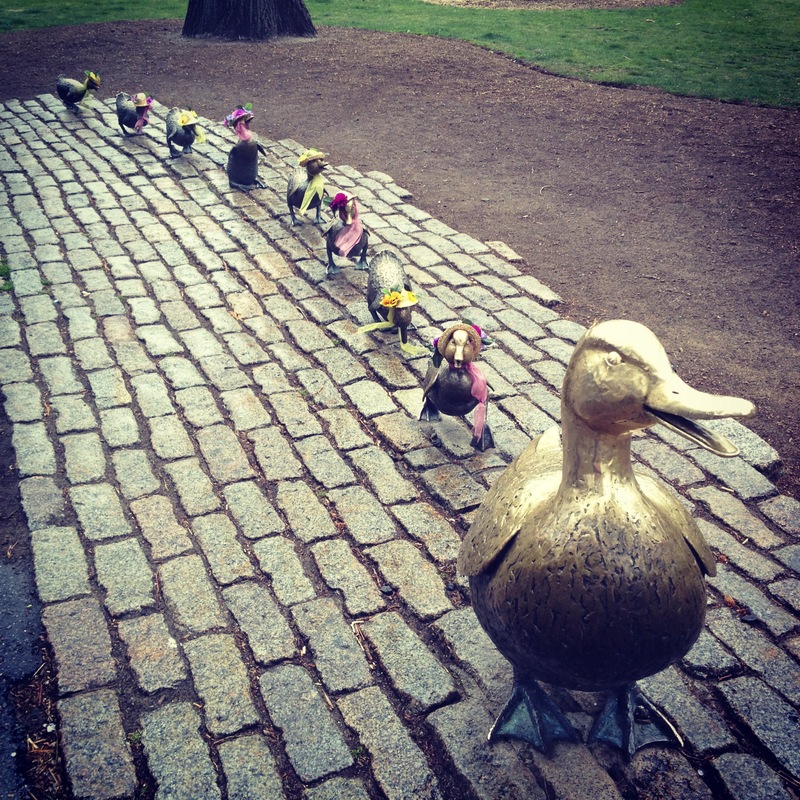 But even in the rain I had to stop and get a picture of the Make Way for Ducklings ducks in the Public Garden because they have hats! Ducks in little spring bonnets! It brightened my rainy walk, though I am concerned that the momma duck has no hat. This was the Boston UnCommon Roll: crunchy spicy salmon, tuna, avocado, mango, black tobiko and gold leaf. 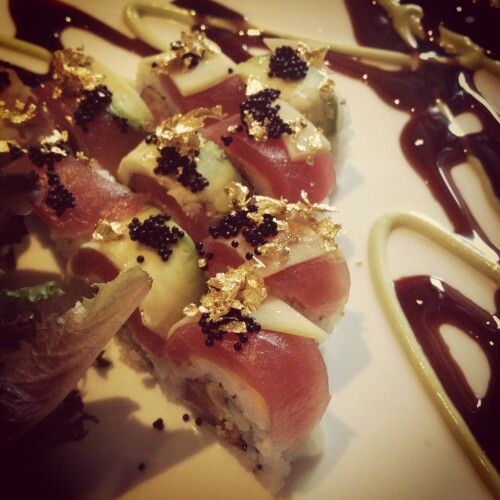 And it was as tasty as it looks. By the end of lunch (that also included sesame mochi ice cream!) the rain had let up a bit so it was not quite so soggy getting home but it is still rather chilly. I also walked under the bleachers that were being set up for the Boston Marathon on Monday. 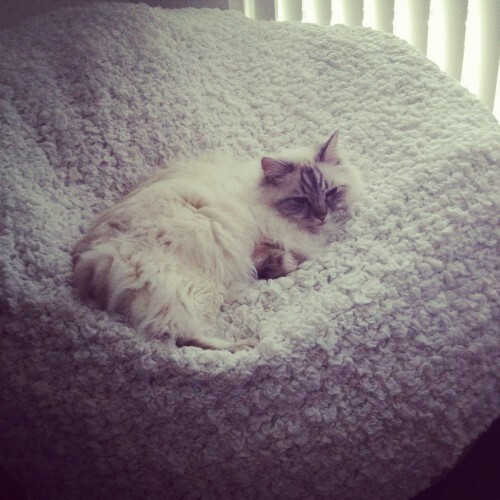 And then when I got home Tessa had decided she liked the beanbag chair that she never sits on, maybe because I’d thrown a blanket over it, and she looked like she was floating on marshmallow cloud. So that was my Thursday, April 12th in pictures. A sushi-filled day with ducks in hats and rain and kittens and tea, though the tea is not pictured. We were sick of the winter and we wanted to get the sun back. We yelled for it but it couldn’t hear us. 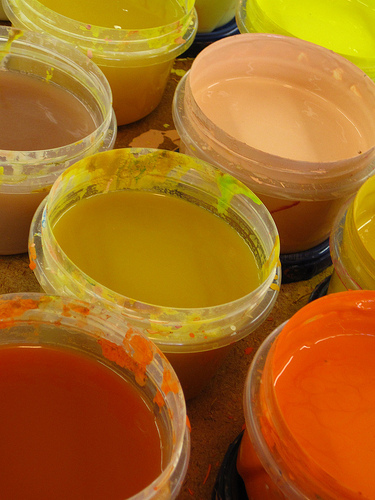 We thought maybe it would be able to see us through the clouds if everything wasn’t so grey so we got a lot of paint. We argued about colors the sun would like but we settled on the brightest, warmest ones that looked summer-hot and sunshine-y. We put all the bright warm colors in buckets and dragged the buckets out to the backyard. We had to take each color bucket one at a time because they were heavy and we both agreed that the yellows were the heaviest but we couldn’t figure out why. We painted the house and the trees and the dry grass. We dipped our feet in the heavy yellows and our braids in orange and peach and mango and when we were all covered in sunshine colors we did a sunshine dance and tried to get the cat to dance with us and he didn’t want to but we got him nice and sunshine-y, too. After the dancing we were tired and it was nighttime and the sun probably couldn’t see us anymore even through the clouds so we went to bed. In the morning the sun was out and all the paint was gone.